Those are truly frightening on so many levels. We have made a big effort lately to eat food in a more pure form. Minimally processed, no ingredients we can not read. I have become more aware how many ingredients are in some of the more processed foods. Not to say we eat within those rules all the time but definitely makes one more aware of the amount of “junk” in many foods. Caffeine should be enjoyed in coffee and chocolate where it occurs “naturally”. NOOOOOOOOOOOOOOOOOO ! this is too bad ! We actually really appreciate all opinions and comments on our product! Thank goodness we live in a Country where we are free to share our opinions. We are also a country built on the spirit of free enterprise and Entrepreneurship. 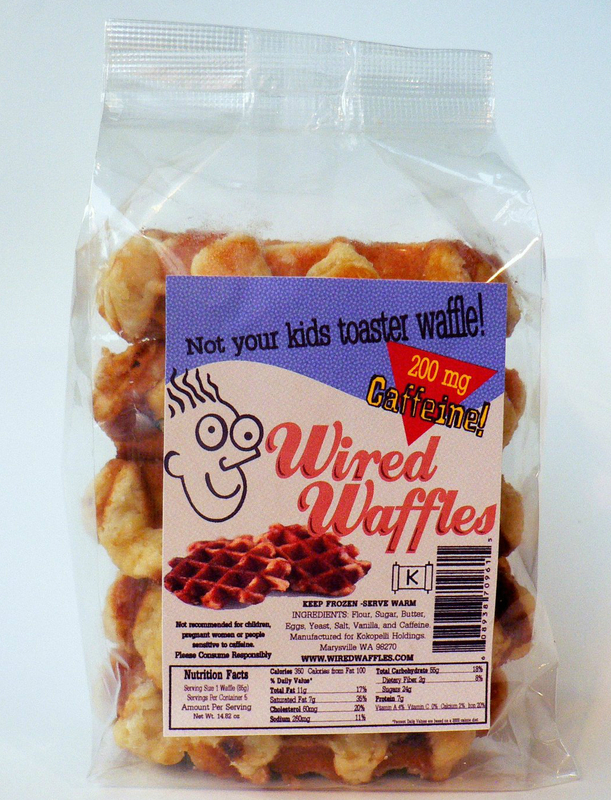 We did not create Wired Waffles to be exploitative, but fill a need. There are many people who we have found do not like coffee or even energy drinks, but still are looking for a kick. In the last few days we have talked to many who have resorted to caffeine pills and copious amounts of energy drinks to get by which I am sure you will agree are far more dangerous. It was very important that we created a product that was good all on its own. Please take the time to stop by, introduce yourself and try a sample on me, you will see that all 8 of our ingredients are not only pronounceable, but 100% totally natural. Which is most likely why Whole Foods will be picking them up after the first of the year. Quite simply Wired Waffles are not only delicious but we are trying to set a standard for energy supplements. In our crazy fast paced society caffeine is here to stay and we are proud of our product! Unfortunately for me English was never as fun for me as my other subjects and as a business owner, well I guess its pretty obvious I need some help with my copy ! lol. Roger, thanks for your response and for being a good sport concerning my criticism. See, I might have a coffee habit, but I truly wish I didn’t, and I wish that ours wasn’t a “crazy fast paced society” wherein people feel the need for stimulants just to keep up. I happen to love the flavor of coffee and the pleasure of a hot beverage and so caffeine is a secondary consideration for me. I won’t deny that I lean on the caffeine for a boost or a degree of alertness from time to time, but I’d MUCH prefer the elimination of the underlying cultural problems that motivate people to use substances in order to cope, and I believe that there are other ways to cope with the rat race that don’t involve stimulants, such as regular exercise, a good diet, yoga, meditation, therapy, etc.